Like every year, Orion also arranged a armature golf tournament in the country. “Orion 34th Bangladesh Amateur Championship 2019” started on 15th January at Kurmitola Golf Club under the overall supervision of Bangladesh Golf Federation. This is a premier amateur international golf tournament and will continue till 18th January 2019. ORION, one of the largest conglomerates in Bangladesh, is the proud sponsor of this prestigious tournament for the third consecutive time in a row. The tournament was inaugurated by Major General Md Enayet Ullah, BSP ndu, psc, Commandant Defence Service Command and Staff College and Senior Vice President of Bangladesh Golf Federation on Monday, January 14, 2019 at Kurmitola Golf Club, Dhaka. Among others, the Executive Directors of Orion Lt General Sabbir Ahmed (Rtd) and Maj Gen Salauddin Miaji (Rtd), Mr. Farduddin Khan, Associate of Orion, Brigadier General Abdiur Reza Khan (Retd), Tournament Director and Chief Referee and Brigadier General GSM Hamidur Rahman (Retd), Joint Secretary, Bangladesh Golf Federation were present at the auspicious occasion. Besides the local amateur golfers, the national team and top amateur golfers of Afghanistan, Bhutan, Nepal, Pakistan and the host country Bangladesh are participating in the tournament. Moreover, there are 21 expatriates of different countries are taking part in this tournament. Golfers from other Golf Clubs of the country are also participating. We are looking forward for some exciting rounds of golf over the next few days. It is pertinent to mention that tournament is being held in the challenging 18 hole golf course of Kurmitola Golf Club. 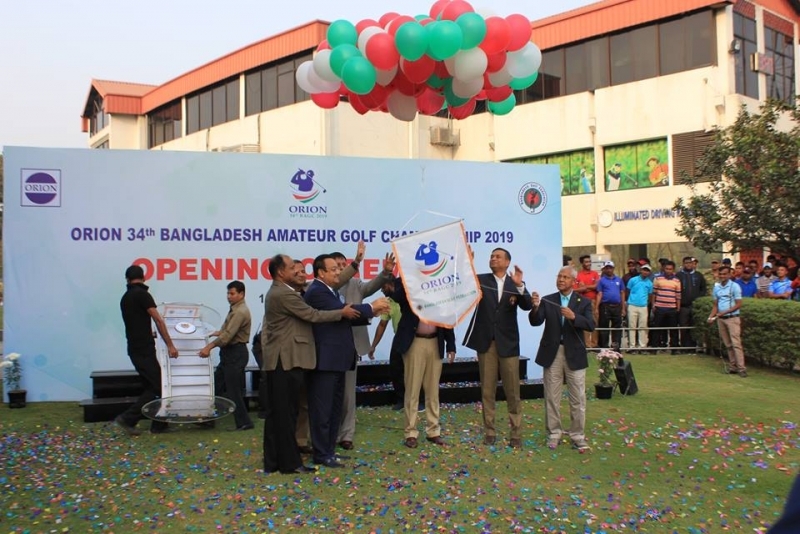 ORION, being the proud sponsor of amateur events in Bangladesh proved their dedication for the development of golf once again by sponsoring this prestigious event for consecutive third year. ORION is also the permanent Sponsor of the ‘Orion Illuminated Driving Range’ of Kurmitola Golf Club. ORION always believes in developing the sports sector by inspiring the people of all ages in Bangladesh. The Closing ceremony of this tournament will be held at Kurmitola Golf Club Banquet Hall at 7:30 PM on January 18, 2019. Chief of General Staff of Bangladesh Army Lieutenant General Md Shafiqur Rahman will give away the prizes amongst the winners of the tournament as the Chief Guest.